Home » Our Doctors » Matthew S. Wang, O.D. Dr. Matt attended Whittier College on an academic scholarship where he studied chemistry and music then went on to the Southern California College of Optometry to earn his doctorate in optometry. 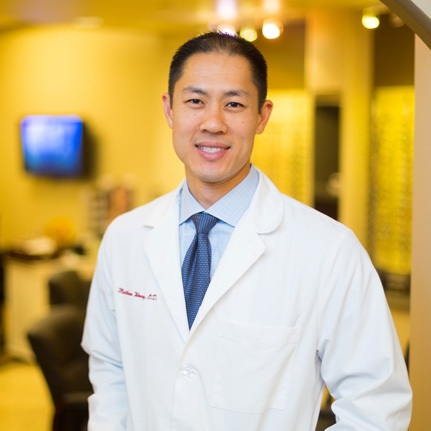 He is a past president of the Orange County Optometric Society and was named Young Optometrist of the Year in 2008 by the California Optometric Association. He is a member of the American Academy of Orthokeratology and Myopia control and serves as Wave Contact Lenses national clinical consultant for orthokeratology. Dr. Matt has held staff positions at Harbor UCLA Medical Center and Long Beach Comprehensive Health Center with emphases in diabetic eye care and glaucoma. In 2018, he was invited to be an adjunct faculty member for the Southern California College of Optometry. Dr. Matt resides in Lake Forest with his wife Christine, an Irvine Unified elementary school teacher, and three children. Away from the office, he can often be found on a basketball court or out camping and hiking with the family.